The tropical almond is quite different from the almond tree whose nuts we all love. 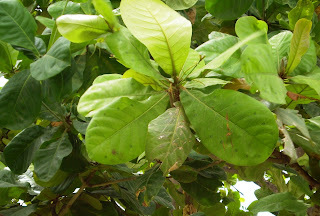 The tropical almond is a deciduous tree grown for the shade it provides and for its beauty. 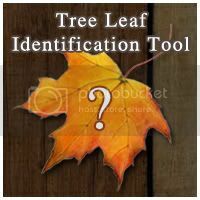 The leaves turn a beautiful reddish brown color before falling. 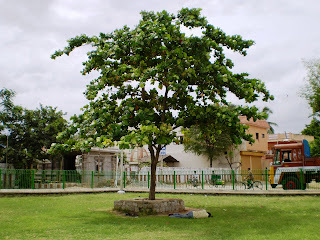 Here is a tree that I photographed in the south Indian town of Kanchipuram. 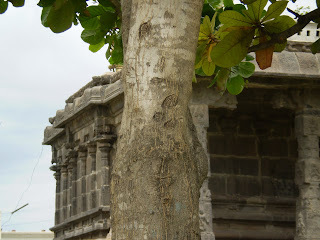 The tree has a host of local names - the Indian Almond, Bengal Almond, Singapore Almond, Sea Almond, among others. The leaves in this picture are sunwashed -- they were actually quite dark green in color.